Jules has been cooking this dish for years. Far from fancy but really tasty and super quick. Also popular with kids but leave out the chilli if they’re not that way inclined. 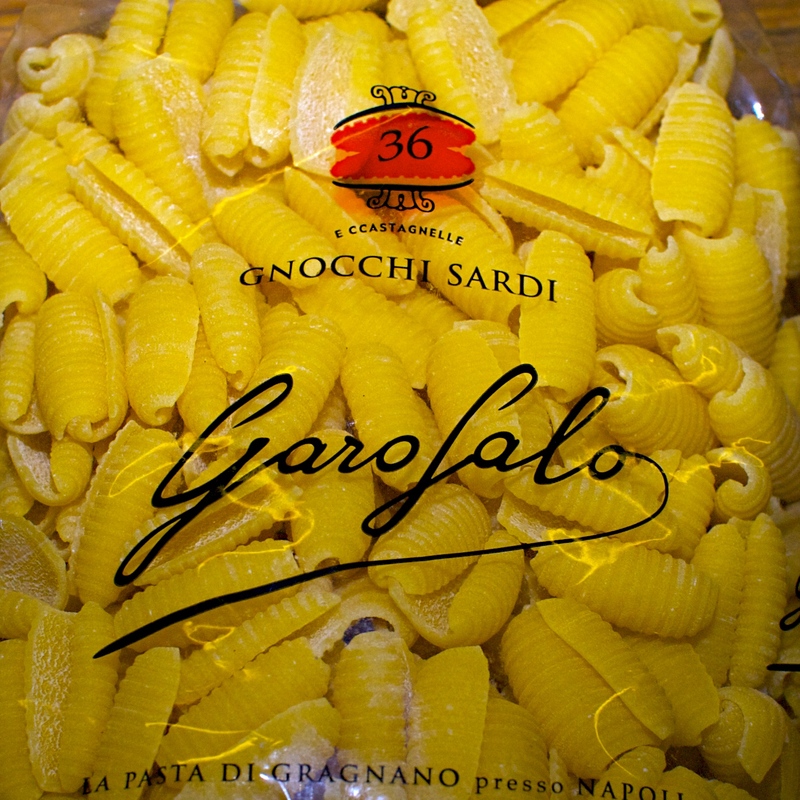 Wine Suggestion: A robust Italian, more than likely a Sangiovese, is our wine for this type of dish. Today it was the Tenuta Sant’Alfonso Chianti. Put a large saucepan of water on to boil for the pasta. Heat the oil in a large frying pan and fry the sausages until they are nicely browned. Turn down the heat and add the onion and garlic, then cook until softened. Stir in the chilli powder and tomatoes, then bring to the boil before turning down the heat and leaving to bubble for about 10 minutes while you cook the pasta. Cook the pasta in the boiling water according to the pack instructions, then drain. Tip the cooked pasta into the frying pan with the saucy sausages and mix well. Serve with crusty bread. When it is done right a sausage roll can be a real treat, but too often they’re a bit disappointing. This is usually due to grey pastry and cheap sausage meat stuffing but this is easily remedied by making your own. They’re just the trick if you’ve overindulged the night before. Wine suggestion: if you feel like wine make it an easy, juicy and inexpensive new world shiraz like the Beelgara Estate Shiraz from the Riverland in Australia. Satisfying and flavoursome but uncomplicated and fruity. Gently split the sausage skins with a sharp knife and remove. They should come off very easily in one piece. Squeeze the skinned sausages together with your hands to form a fat log. Unroll the pastry sheet and place the sausage meat lengthways down the centre of one side. Lay a few sage leaves on top if you like. Brush the edges of the pastry with milk, then fold over the sausagemeat and seal the edge. Cut slashes along the top of the sausage roll with a sharp knife. Bake for about 30 minutes or until golden brown. Cut into slices to serve. Despite the simplicity of this dish it really showcases perfectly ripe cherry tomatoes; excellent when the garden is overflowing and you’re trying to think of recipes to use them all! 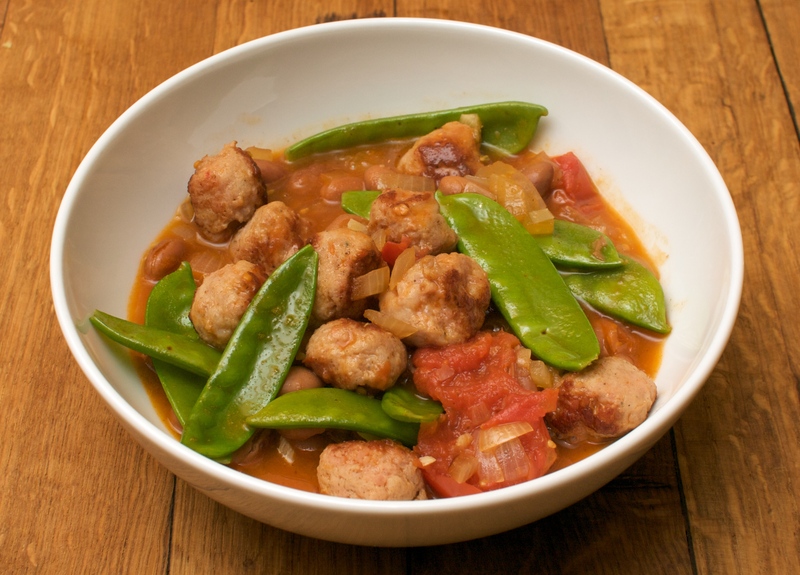 One of our butchers does great, meaty and coarsely filled chipolata sausages which we used here, but Cumberland or coarse Italian ones work just as well. 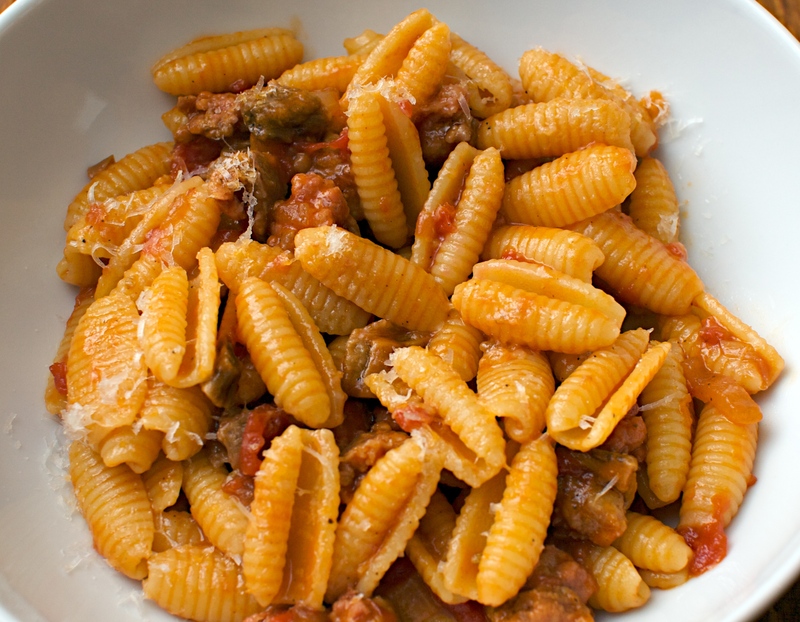 Leftovers make a great pasta sauce (see below). It’s might be a bit early yet for Irish garden tomatoes but our friend Patty, who has just left Ireland to become the Garden Program Director at the University of the Pacific in Stockton California, has a huge tomato glut. So we promised a tomato recipe to help Patty, Michael, and the rest of the staff use up all the tomatoes. Wine suggestion: Great with a robust and juicy red, don’t over complicate it and pick a moderately priced one. We’ve tried Southern Italian Primitivo’s, Barbera from the north, Cotes du Rhone, Spanish Tempranillo’s and Garnacha and a couple of juicy Aussie Shiraz’s. All work a treat. Californians won’t go wrong with a good Lodi Zin! Put the tomatoes, herbs, oregano, garlic and sausages in a large roasting tray – big enough to take the tomatoes in a single layer. Drizzle with the olive oil and balsamic vinegar and season with salt and pepper. Toss together and make sure the sausages end up on the top, then bake for 30 minutes in the hot oven. Give the tin a good shake and turn the sausages over, then return to the oven for 15-30 minutes or until the sausages are at your desired level of stickiness (we like them pretty sticky!). Lift the sausages out of the sauce, then put the tray on the hob and reduce the sauce to a nice thick consistency, before putting the sausages back in. Check the seasoning and serve with some warm bread and a green salad. 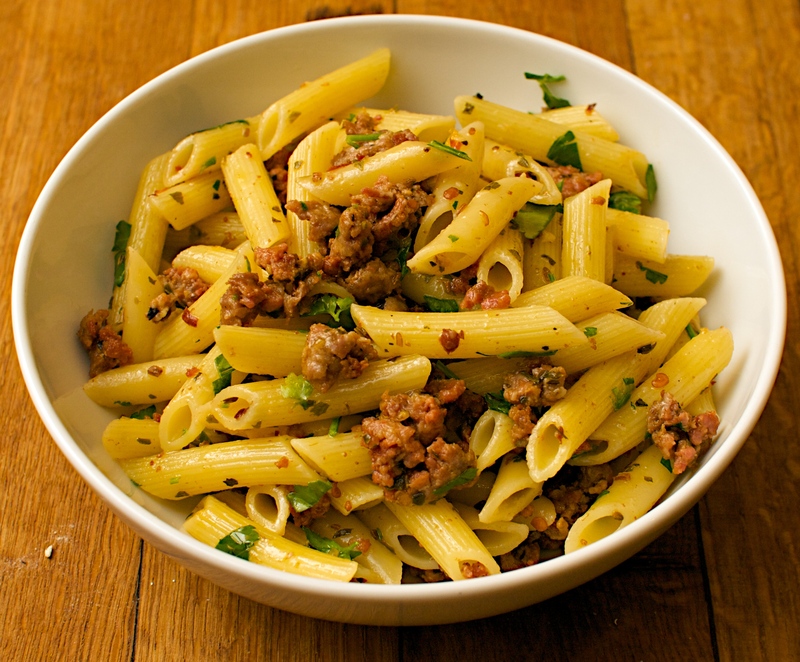 As the bake makes loads just chop up the leftovers the next day and reheat to serve with penne or another chunky pasta like rigatoni or macaroni. Delicious altogether! 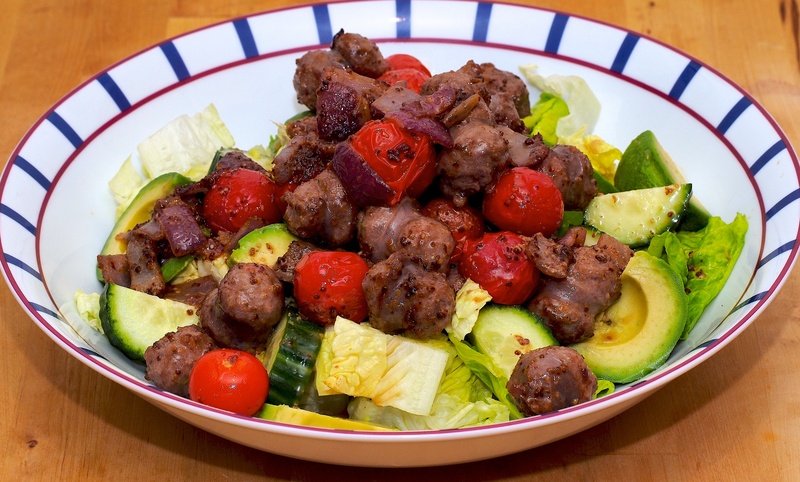 We wouldn’t normally think of putting sausages in our salad but this worked surprisingly well. Heat the oil in a deep frying pan. Add the sausages and onion and fry for a couple of minutes or until browned. Add the mustard, sugar and tomatoes and cook for another few minutes or until the tomatoes are starting to split and everything is well coated. Meanwhile, separate the lettuce leaves, slice the avocado and the cucumber. Toss together in a salad bowl. Spoon the hot sausages over the top. Add the vinegar and 1 tbsp water to the hot pan and stir over the heat, scraping all the sticky bits from the bottom of the pan. Spoon the pan juices over the salad and serve with some crusty bread. Wine Suggestion: This is definitely a week-night dish so no need to blow the budget on the wine. A red Côtes du Rhône or a Languedoc would do nicely. Good Friday night stuff this. We always have a stash of good quality sausages from Sienna in the freezer. This is a Jamie recipe called “Proper blokes’ sausage fusilli”. We assure you that proper ladies like it too! Crush the fennel seeds and chillies in a pestle and mortar until coarsely ground. Heat a splash of olive oil in a heavy frying pan. Skin the sausages and add the meat to the pan, breaking it up with a wooden spoon. Fry for a few minutes until it starts to colour and the fat has started to render, keep crushing it until it looks like coarse mince. Add the crushed fennel and chillies and cook on a medium heat for about 10 minutes until the meat looks crispy and golden brown. Stir in the oregano, then pour in the wine and reduce it by half. Add the lemon zest and juice. Turn the heat to low while you cook your pasta according to the pack. Drain the pasta but reserve a little cooking water. Toss the pasta well with the sausagemeat, then add the butter, Parmesan, chopped parsley and a few spoons of the reserved water. You should have a loose, shiny sauce. Taste and adjust the seasoning, then serve with some extra Parmesan. Wine Suggestion: The recipe book suggests a Valpolicella Classico which would be good but we reckon the bit of extra acidity from a Chianti would work better. Or if you like your wines fruitier and softer try something from the Tuscan coast, the Maremma. Great mid-week comfort food; rich and delicious and easy to make. We had all these ingredients in the fridge or freezer too so it made our dinner really cheap. This was so delicious that if we’d have made a larger amount Jono probably would have scoffed that too! Using good ingredients helps as we had two lovely Toulouse sausages in the freezer and good quality cherry tomatoes in a tin in the cupboard. These lifted the richness and depth of flavour. Remove the skins from the sausages and roll the meat into little balls. Heat then brush a frying pan with oil and brown the meatballs until golden and any oil is released. Remove meatballs and add the onion, garlic, fennel seeds and chilli flakes to the pan. Season and cook for 5 minutes. Add the tin of cherry tomatoes and 300ml stock. Bring to the boil and then add the meatballs and borlotti beans. Cook for 10 minutes. Now add the green beans or sugar snaps and cook for a further 5 minutes (until the greens are just tender). Wine suggestion: Great with a warm, but not heavy red. A Nero d’Avola or other southern Italian would work really well, but so would a cooler climate, New World shiraz or cabernet, particularly if it has a little bit of age to mellow out the tannins. Avoid the jammy, higher alcohol reds as these would overwhelm the dish.